That’s the overall advice of the U.S. Consumer Financial Protection Bureau (CFPB). And while it sounds simple enough, a lot of thought should go into financing a car, truck or SUV if you don’t want to overpay – or overextend yourself financially. Over the next four weeks, we’ll share with you some of the CFPB’s advice on financing a vehicle. How to shop for your auto loan, not just your car [Part 2]. Financing a car is the second-largest financial obligation for many Americans (after a home mortgage), so it makes sense to take the time to understand the process and get the right deal. Those seven factors are (1) the price of the vehicle, (2) additional features, services or add-ons, (3) expenses such as delivery charges and origination, document and preparation fees, (4) down payment, (5) trade-in value, (6) interest rate, and (7) length of loan in months. The CFPB also recommends taking the printable worksheet with you to the dealership to “show you are serious about getting the best loan” if you plan to finance the vehicle there. Whether you follow that advice is up to you, of course, but determining your upfront costs, calculating how much you will need to borrow, knowing how much money you’ll pay over the life of your loan, and finding the total cost of your purchase should be a part of your process. Then you can be more confident that your vehicle purchase will fit into your budget and that the monthly payments won’t cause financial problems in the future. 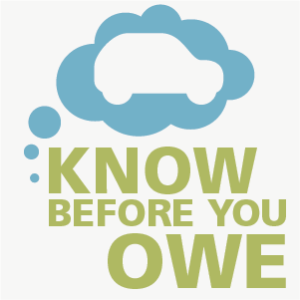 The vehicle you want may not be the one you can afford, so it pays to know before you owe.